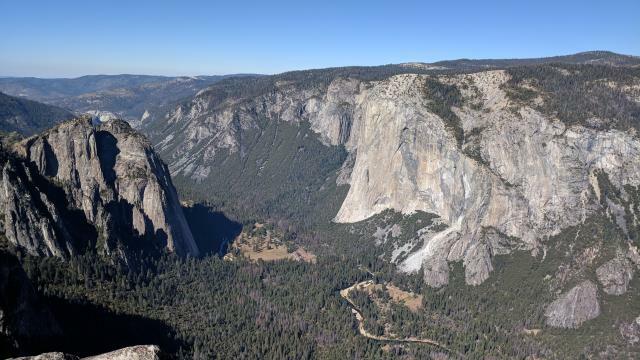 A view of El Capitan and part of the western half of Yosemite Valley as seen from Taft Point. The hike to Taft Point is not long, but it's mostly downhill to get to the turnaround point and mostly uphill on the way back to the trailhead. Just keep this in mind if you're not used to hiking anything other than very short distances. Just a few paces from the trailhead, veer left at the junction to head to Taft Point. The trail to the right heads to the summit of Sentinel Dome. Not terribly long after that keep on the lookout for an enormous mound of white quartz rock. to the right of the trail. Coppertone stands near a sheer ledge on the opposite side of one the fissures. The majority of the trail passes gently through a forested area on either flat or gently descending terrain. As the trail nears Taft Point the trail surface turns to more solid rock and the trail, as much as it can be determined, splinters into several different paths all leading towards the edge. Sprinkled amidst the rock are patches of Manzanita and Jeffrey Pine. Austin Explorer standing near the edge of Taft Point overlooking Yosemite Valley. The fissures are large cracks in the rock that provide narrow slot views onto the valley floor, thousands of feet below. The trail tends to pass over them just at a point before the fissure truly opens up. Looking for the easy crossing point of the fissures is highly recommended. Taft Point is a short distance beyond the fissures and can be spotted by a metal railing on the edge of the sheer cliffs to be found here. The protective metal railing only covers a small fraction of total perimeter of the point that overlooks the valley below. 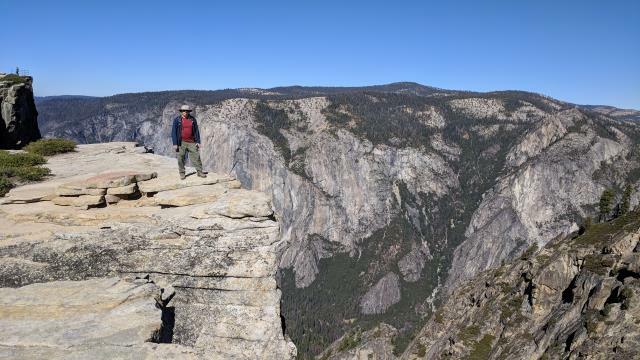 It really should not have to be said, but care should be taken when walking near the cliff edges at all times whether it be at the fissures or Taft Point. Several people die in Yosemite each year and the enormous vertical rock faces here are conducive to accidents for those not careful. 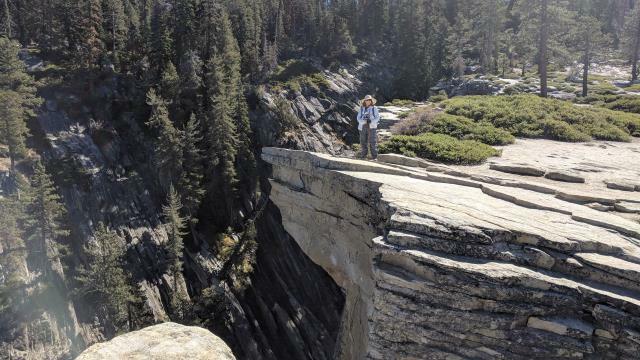 Taft Point saw two people fall to their deaths in October 2018. The return to the trailhead merely follows the path taken thus far back to the trailhead. From Taft Point there will be a slight decline and then mostly gentle climbing back to the starting point. Coppertone and I decided to do this hike as our first during our first ever trip to Yosemite. We started off at the Sentinel Dome parking area (we also hiked that trail today) and veered left soon after the trailhead. Not far down the trail sits a huge chunk of quartz, one of the largest I've seen not in a linear form. Along the trail another hiker keyed us in on a grouse hen sitting motionless just off the trail. We paused for a moment to look before continuing on. At no point did she seem to move a muscle. Much to our surprise we watched the Blue Angels fly over the valley several times before flying off into the distance. Just coming from the Bay Area we knew they were in San Francisco for Fleet Week just days ago. We never thought we would see them here. Once the trail makes it near Taft Point the solid rock surface lets the hiker spread out and explore numerous spots on the edge of sheer dropoffs. We had lunch while soaking in the views. El Capitan is easily within view and large part of the valley unfolds below. Hiked this one with Austin Explorer.